Took me a couple hours after finishing Ruin and Rising to write a review, and that was because I was DEAD after reading it. When I started Shadow and Bone (Book 1) I saw hints of familiar YA cliches, but in their barest forms. Now I laugh when I think I thought this series would follow any sort of pattern. Every time I thought I had an idea of what was happening or felt like my feelings on certain characters were solid, Bardugo pulled the rug out from under me and I loved how it kept me guessing in the best sort of way. So many people told me Ruin and Rising would be amazing. 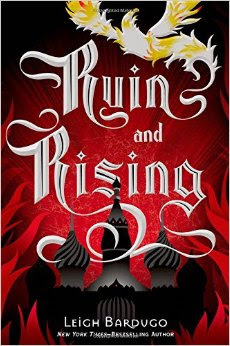 And while I try to reserve my hopes, I had enjoyed the first two books in this trilogy so much that I couldn’t help but feel like Bardugo was going to really deliver. But when I began nearing the last 100 pages and almost nothing was resolved, I started to get nervous. I just couldn’t see how she could wrap it up without cutting corners or making it feel rushed. But she managed and then some, because the last 100 pages are EVERYTHING. There is drama, action, tension, and FEEEEEELINGS. I did not feel like it was rushed either. Generally, when I find myself overcome with the feels, it’s because of what is happening to the characters. And this time it was no different. But on top of that, I found that I was overcome with my own personal feelings of surprise. There were several things that happened at the end of this book that completely surprised me. I was actually stunned. ha. And it was so refreshing and heartbreaking at the same time. Never, ever have I felt so much for a villain. I loved this story, and I loved how Bardugo wrapped it up. I only wish that she would rewrite this entire series from The Darkling's point of view now. This is the first book that has surprised me like this in a long time. I'm highly recommending this one. Great world, great characters, great growth, and some refreshing surprises.